Why do companies ask what other companies you’re interviewing with? Do you need to tell them the company names? And what are you supposed to say if you’re not interviewing anywhere else? 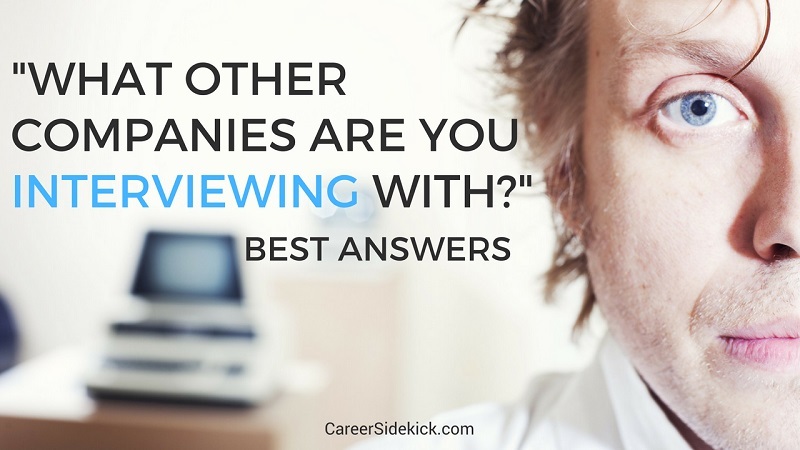 First, why do interviewers ask what other companies you’re interviewing at? Here’s the deal. I write about interview questions a lot. And usually I talk about how questions have hidden traps, how there are “secret” things the hiring manager is looking for, etc. This question is different. Most people make a big deal and get all worked up when the company asks who else you’re interviewing with. But it’s NOT a big deal and there aren’t many hidden traps or pitfalls really. Just a few. They want to get a sense of your job search and what you’re looking for. That’s it. Seriously. They want to see how their company and position fits into what you’re looking for overall. It’s a big red flag if you’re applying for 10 HR jobs and then one single sales job. They’re going to wonder “why sales?”… So ideally you want to be able to show them you’re looking at many sales jobs. When they ask “what other companies are you interviewing at?”… your main goal is to show them you’re looking at jobs that are similar to theirs. First, don’t reveal the names of the other companies. There’s no benefit to sharing this, and it’s not something they need to know. So politely decline. I have word-for-word answers in the next section, including what to say if they press you for company names! The second mistake to avoid… Don’t say that you’re not interviewing anywhere else. You want to seem in-demand, and like your job search is going well. That’s probably the second most important thing to do in your answer, right behind showing them that their job fits what you’re looking for overall! Why do they care how your job search is going? Employers want someone who is in-demand and desirable, so you do NOT want to sound frustrated, disappointed, or anything else like that. Now let’s look at some example answers, including how to avoid giving them other company names, what to say if you’re not interviewing with any other companies, and more. Like I mentioned earlier you do NOT want to sound like you have no other prospects. So use this script even if you’ve had zero other interviews. Just say you’re doing phone interviews and it’s still early in your search. Use this if you’re a bit further along in your job search. Tell the truth about job offers. Don’t use this script above if you actually have job offers. There’s no benefit to lying about that. One exception: It’s different if you’re interviewing with a recruiter. They represent many companies and need to know who you’ve already spoken to, or else they’ll be wasting their time potentially sending your resume to companies who already know you. So if you’re working with a recruiter, go ahead and share this info. If you don’t, they’re very unlikely to spend any time helping you. To recap, if you look through the sample answers above you’ll see we followed the the most important rules – showing them we’re being laser-focused in our job search and that their job fits what we want, making it sound like the job hunt is going well so far, and not revealing any specific company names. Remember if you’re just starting out, always say you’ve had a few phone interviews. Don’t ever say “this is my first interview of the year.” Just copy my script #1 and say that each time.